Easter means eggs. And not just chocolate ones! We got some great fresh ones from our neighbours chickens. Fresh free range eggs taste so good compared to the factory variant that you can still buy in the supermarket. It’s almost like a different product! Soft boiling with some freshly baked bread is probably still one of my favourite breakfast ways, but this time I opted for my own version of ‘oeuf en cocotte’ – eggs in a pot. Traditionally made with crème fraiche, which i didn’t have, i used some full milk at the bottom of the pot, cracked the egg in it and put some home-made haloumi over the top. 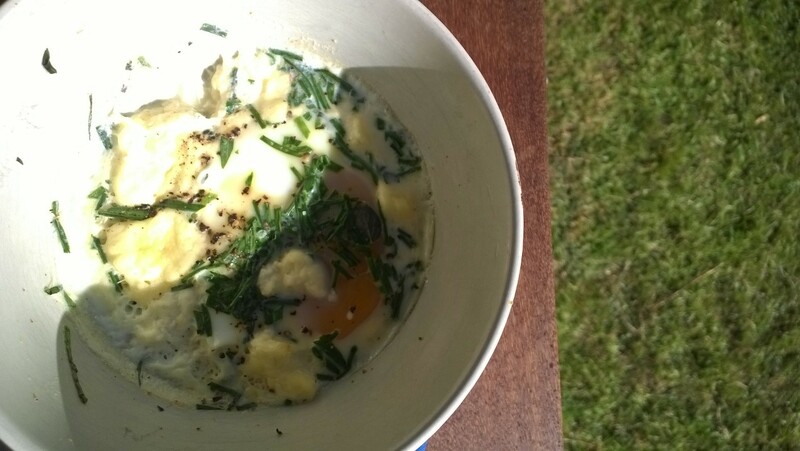 I also chopped some freshly cut chives which I added under and on top of the eggs. Put in the oven at 200 Celsius for 8 minute, et voila, a beautiful Easter egg extravaganza! This entry was posted in A to Z challenge, kaipara, localfood, Something Good and tagged a to z. Bookmark the permalink.